Jump to the 2017-18 Leaf Pearl Hockey checklist. 2017-18 Leaf Pearl Hockey marks the first time Leaf’s luxury line has centered on a single sport. Following a similar path as the multi-sport 2017 Leaf Pearl, just about everything features autographs, memorabilia or a combination of the two. The only ones that don’t are the base cards. But even those come with their own premium angle as they’re embedded with a pearl. 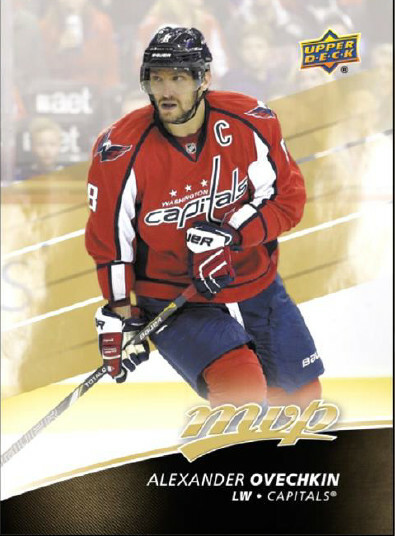 Base cards have Silver, Gold and Black versions. Players are all legends. Like many of company’s hockey products, the 2017-18 Leaf Pearl Hockey checklist is a deep-dive into the game’s history. It reaches all the way back to early pioneers in the sport through to more modern superstars. This comes through in both the signatures and the memorabilia. Base Autographs carry a similar design as the main set. Names range from Gordie Howe to Mario Lemieux. Other autograph inserts include Paragon Signatures, Paragon Dual Signatures and Paragon Triple Signatures. Whether it’s one player or three, these also have memorabilia. Pearl 8 Signatures take a double-sided approach with autographs from eight different players. Combinations include players from the same franchise and stars from similar eras. And then there’s the Pearl Hockey History Book. These take the idea of a cut signature-memorabilia book card combo and go with a major piece. The card that’s previewed has Cyclone Taylor and a massive piece of an early skate buckle. Pearl digs deep for premium swatches, materials and other notable pieces of hockey history. 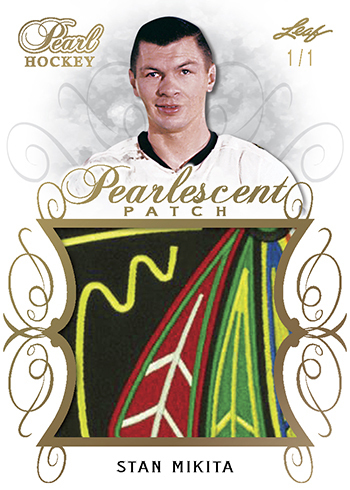 Pearlescent Patch has over-sized pieces of game-used gear from the likes of Tim Horton and Stan Mikita. The insert also has a dual patch version spotlighting a pair of players. 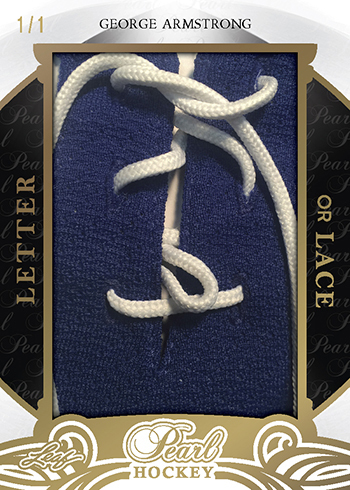 Letter or Lace goes the jumbo route with either a nameplate letter or the laces from a jersey front. 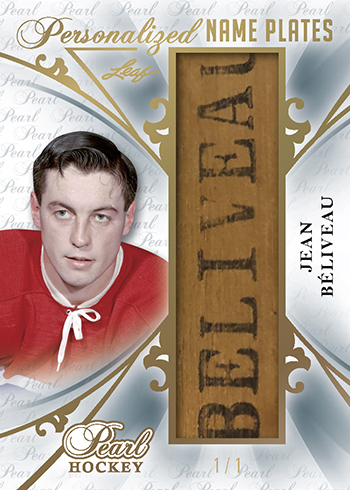 Personalized has stick nameplates used by Jean Beliveau, Joe Sakic and more. Magnum Opus takes the concept further with two nameplates. 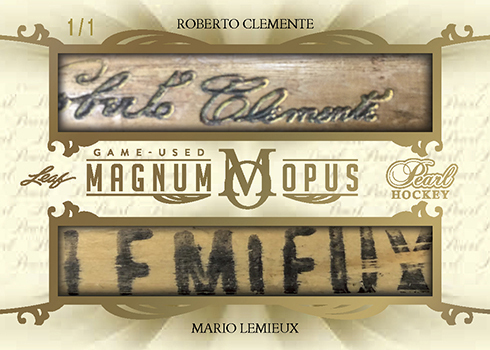 Some cards also combine hockey with similar pieces from other sports like bat barrels. 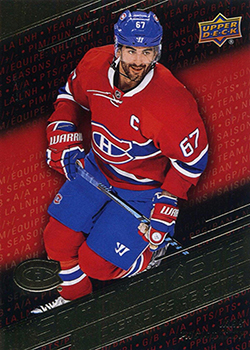 Leaf is also promising the first logo card with the NHL Shield and NBA Logoman. The names of the two players on the card haven’t been dropped yet. 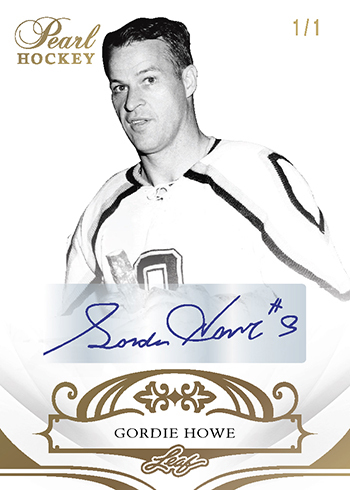 Other memorabilia inserts include Pearls of Hockey, eight-swatch Magnificent Materials and the eight-player Pearls of History 8. 2017-18 Leaf Pearl Hockey is primarily about the one sport. However, it does cross over to a few areas beyond the game. Nowhere is this more apparent as Pearl Cuts. 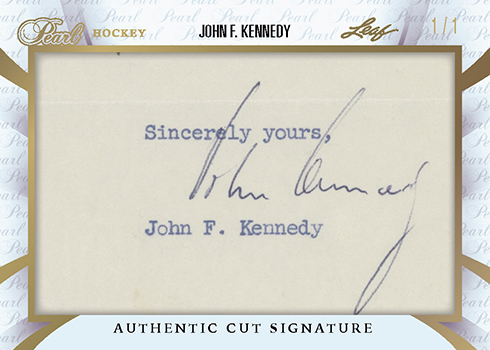 Landing approximately one per box, these take a historical approach to cut signatures. 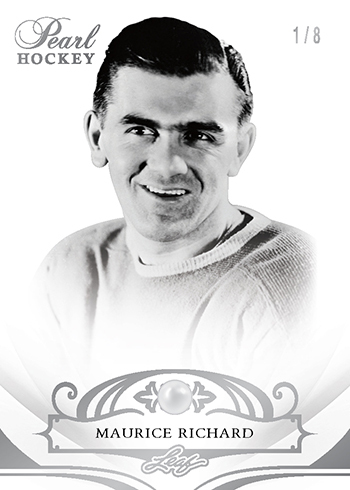 The varied names range from Cyclone Taylor to Abraham Lincoln to John Wayne. 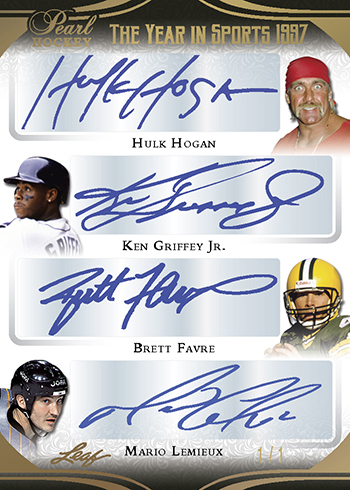 The Year in Sports is an autograph insert that has signatures from four athletes who were making headlines around the same time. Pearl City Signatures have autographs from three people who were icons in the same place. 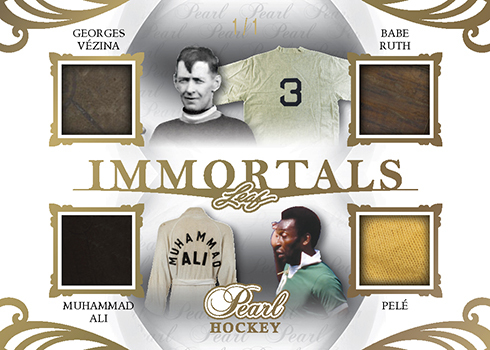 Pearl Immortals 2 and Pearl Immortals 4 have memorabilia from both hockey players and other athletes. 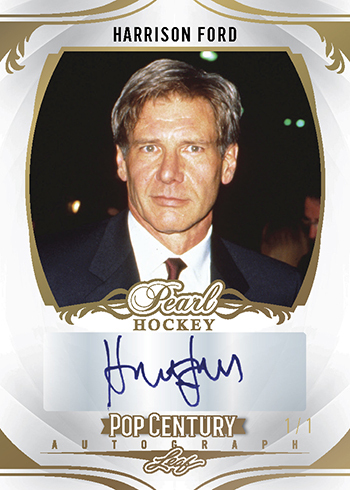 Leaving hockey behind is Pearl Pop Century Preview, offering a glimpse at 2018 Pop Century in the form of a Harrison Ford autograph. Howe and Tretiak have no base version, only select parallels. PP-05, PP-20, PP-21, PP-23, PP-24 have no base version, only select parallels. PPD-08, PPD-09, PPD-10, PPD-11 have no base version, just select parallels.